This album shares the first issue of Gidra magazine (April 1969) as a part of the Japanese American National Museum’s exhibition, Drawing the Line: Japanese American Art, Design & Activism in Post-War Los Angeles on view from October 15, 2011 to February 11, 2011. The inaugural issue included articles about Yellow Power, the Third World Liberation Front, the firing of county coroner Dr. Thomas Noguchi, Yellow Brotherhood, Asian American women, and the establishment of an institute for the study of American Cultures at UCLA. It also included a poem and cartoon about stereotypes. 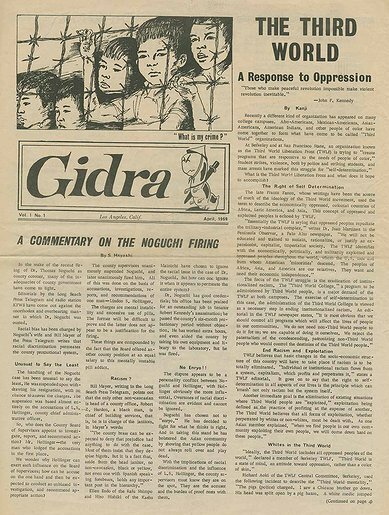 * * * Gidra was a monthly publication that called itself the “voice of the Asian American movement.” Founded by University of California, Los Angeles (UCLA) students in April 1969, the magazine took a radically progressive political position, providing information about the movement not found elsewhere in the mainstream media. The magazine eventually moved off campus, operating out of a series of offices in the Crenshaw area until its last issue went to press in April 1974. The magazine’s sixty issues offered news from the third world struggle perspective—aligning the Asian American movement not only with domestic empowerment movements like the Black Power, Chicano, and Native American movements but also the international struggles of oppressed peoples in Africa, Southeast Asia, and Latin America. Gidra addressed issues like drug abuse in the Asian American community, news about the Vietnam War and the anti-war movement, prison conditions, and the redevelopment of Little Tokyo, among other issues. Art, especially poetry and drawing, were integrated into every issue of the magazine; such creative expressions were crucial to articulating a nascent Asian American identity and were intertwined with the political goals of the movement. The magazine was edited by a changing, non-hierarchical collective that included individuals like Mike Murase, Doug Aihara, Evelyn Yoshimura, Steve Tatsukawa, and Bruce Iwasaki, along with a roster of talented graphic designers and artists that included Alan Takemoto, Dean Toji, David Monkawa, and Glenn Iwasaki. JANM — Last modified Jan 12 2017 6:20 p.m.